I made a visit today to the Historic Dursley Garden in Bideford and was shown around the by the gardens owner, the very effervescent Judith Callaghan. Sadly the the iris in the Del are a few days away from peak bloom. The Gardens were originally designed by Alfred Buxton in 1916 when the property was known as Te Rangi Pai. The name changed to Dursley in the 1930's. The 300 roses and original plantings of trees growing throughout the gardens, the views to the hills allow a visitor to see Buxtons vision still today. If you are in the Wairarapa Region give this garden for all seasons a visit, you will not be disappointed. Hopefully the large Iris Del will be in bloom when I return. Siberian Irises are my first interest in Irises and always give me much joy.My season this year looks to be about 10 days earlier than normal and no I do not think this has to do with climate change!! 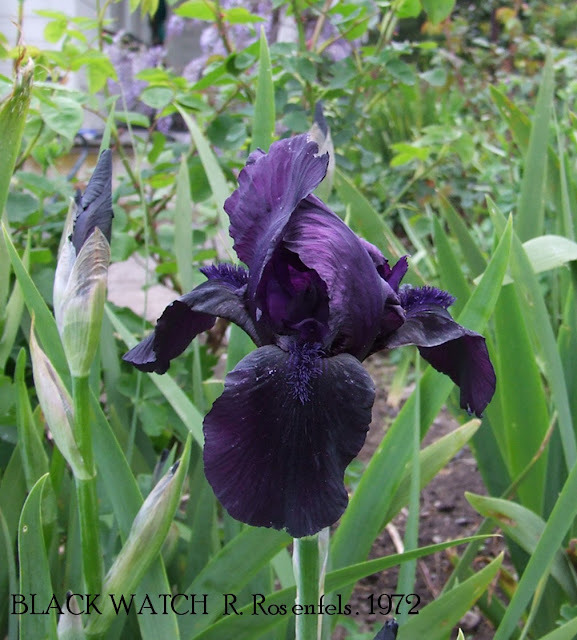 In 2007 'BANISH MISFORTUN which bloom's continuously for the full siberian season won 'The Award of Merit' which is an award for Irises proven of value over at least five years since introduction and this sum's up this iris nicely. Waterson Irises, Wanganui. 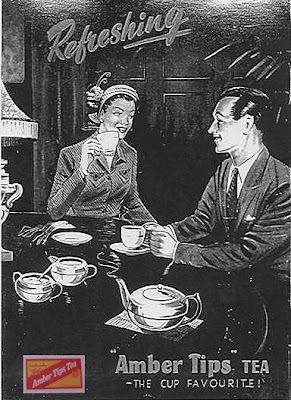 1959-60 Catalogue. 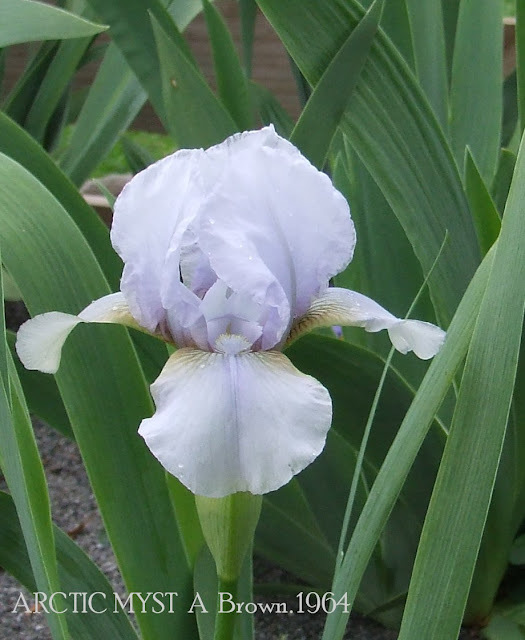 Rarely has a new iris in this country received such high acclaim before its introduction as has this lovely and sensational silver-blue, which we are introducing for its raiser, Mrs. Stevens, this year. During the flowering season last November, there was always a small crowd around Foaming Seas, photographing, examining, or just standing drinking in the beauty of its crystalline blossoms. 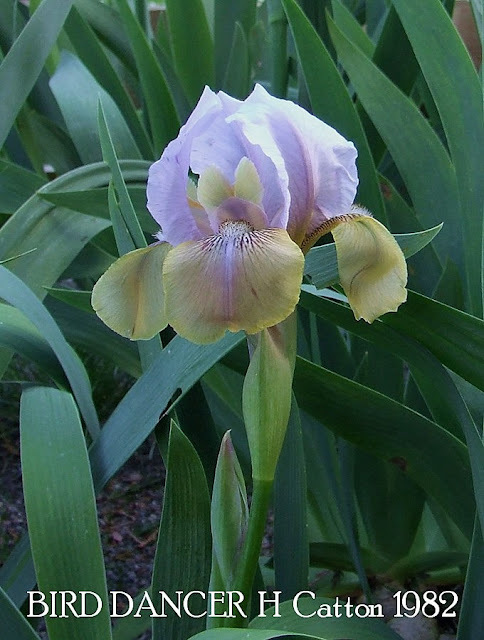 It is being introduced in America later this season by Schreiner’s Iris Gardens of Oregon, and it is due to the courtesy of Mr. Robert Schreiner that we are able to offer it this summer, a few months prior to its American début. The very large flowers, beautifully frilled and ruffled, are lightest silvery blue, deepening softly to an intense silver blue towards the hafts of both standards and falls. A white beard, tipped silver blue where it extends on to the fall, and a clear tracery of blue on the hafts, add to its distinctive individuality. The standards, like the falls, are heavily ruffled and remain firmly upright throughout the life of the flower. 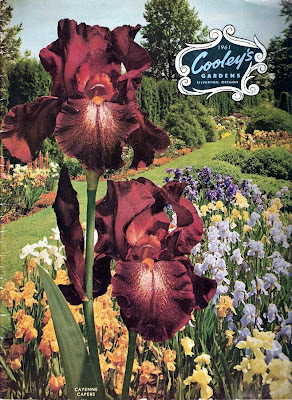 3 ft.
Schreiner's, Salem,Oregon, Iris Lovers Catalog, 1960. Mrs Stevens New Zealand's well known iris hybridizer Combines with her iris hybridising talents a flare for aptness of nomenclature as well exemplified here. This novel frothy light blue suggests the dynamic quality of churning foam-capped seas. An unusual garden iris with an irresistible appeal in the clump. Foaming seas does not carry oncocyclus blood despite its appearance. It is an easy grower and copious bloomer-as well as a natural conversation piece in any garden. 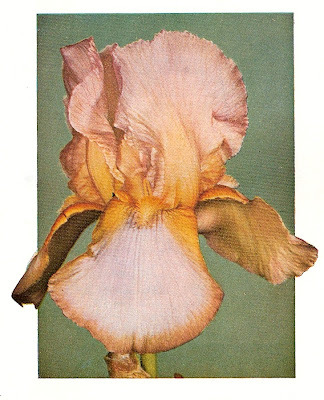 Bulletin of the American Iris Society, January 1962, Number 164. Honors Review and Preview, by Melba Hamlen. Jean Stevens latest creation, is in my opinion her most beautiful iris. The blossoms are large with wide ruffled petals. Light blue with a matching beard, it has subtle purple haft markings that set it apart from others of similar coloring. 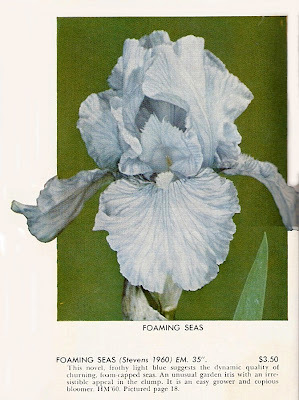 Bulletin of the American Iris Society, October 1962, Number 167. Irises From North Carolina s Coastal Plains to the Foot of Pikes Peak, Ralph and Helen Lewis. FOAMING SEAS (Stevens 1960). This is a big, stylish light blue, notable for purity of color, excellence of form, and a profusion of ruffles. Cooleys Gardens, Silverton, Oregon. Iris Catalog 1964. FOAMING SEAS (Stevens, '60) A frothy, ruffly light blue with deeper veins, suggestive of the churning surf against a rocky shore. The beard is blue-white. Massive flowers, widely spreading in form and freely produced on 3-foot stalks. FOAMING SEAS (Stevens, R. 1957). Sdlg #El 94 /4 . TB 46", B1L. Very pale blue self, slightly deeper at hafts; pale blue-white beard. Jane Phillips x ((((Calpurnia x Morocco Rose) x Summit) x (sister of Summit x Tropic Moon) x Chicory Blue)., Waterson 1959; Schreiner 1960. HM 1960. Paragon (Stevens) 1947. E.M. 36"
Serene lovely rounded flowers of a delicate pearly shell colour or opalescent cool pinks. So cool and morning fresh it is bound to capture your attention and admiration. A hint of copper in a half inch margin around the edge of the petals and the rich mellow throat makes the whole flower glow . Exquisite planted with bright blues or deep violet. Lovely rounded flowers of delicate pearly shell colour draw the attention and admiration of all. Huge flowers of gracefully flared and rounded form with an opalescent light over the heavy substanced petals. A decided margining of soft copper pink edges the falls which are so finely textured that the creamy pink colour seems to glow and flush in the sunlight. Lovely as a specimen plant it is even more exquisite when planted with light blues or deep violets. We think this iris will long be popular. Early. 3 ft.
Another Iris name that was originally used by Jean Stevens, and then used by Joe Ghio. This also applied to the Iris VANITY originally used by Jean Stevens in 1949. Still the iris PROPHECY pictured above is a good looking Iris which shows good increase, long bloom season, and gives pleasure in our garden,but in saying that it sure would have been nice to have both. PROPHECY (Joseph Ghio, R. 1970). Sdlg. 67-95A. TB 36" (91 cm) E-L. Light blue with deeper blue-violet spot on F.; blue beard. 65-125: (Commentary x Greenlee sdlg. : (Native Dancer x (pink sdlg. x (Sharkskin x I. balkana)))) X Mystic Mood., Bay View Gardens 1972. Shown on the front cover of this catalogue in precise and accurate detail. Vivid and flashing with the sunshine on it or through it....glowing and alive on a cloudy day or in the pouring rain. For rich, intense color in a plicata, this-red hot eye-catcher has no parallel. Dominant color is fiery burgundy to red pepper but a mirror area on the falls is lit with cream. Beard is orange-bronze. H.C.AIS 1960. 3 feet tall. Jesse's Song Awarded Honorable Mention 1985, Award of Merit 1987, Dykes Medal 1990. One of the first modern plicata irises to bloom at home and a consistent Rebloomer. Strong straight stems. IRISES A Gardener's Encyclopedia, Claire Austin. This plicata is consistently the first tall bearded Iris to flower in my nursery. The white petals are beautifully speckled with violet. The beads are soft violet, and the neatly ruffled flowers are borne on strong, straight stem. Height; 91 cm (36½in.) Bloom; early to mid season. Parentage; (Charmed Circle x Kiss) X (Smoke Rings x Decolletage).Dykes Medal Winner USA 1990. 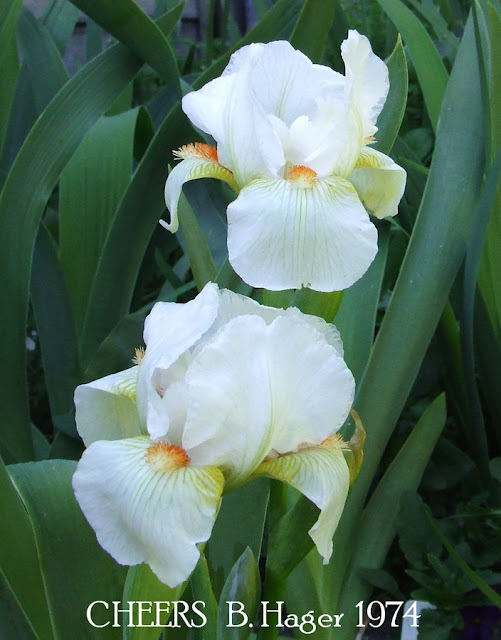 'Jesse's Song' (Williamson 1983) is one of the all-time great Iris, an American Dykes Medal winner and a garden and show Iris without peer. Base colour is white with standards and falls stitched and dotted methyl-violet. Flower form is very attractive with wide ruffled blooms produced throughout the season from early to late on 90 cm or taller spikes that carry from 10 to 12 quality blooms. 'Jesse's Song' is healthy, vigorous, and a very quick increaser to provide a garden spectacle in all climates where its versatility and consistency ensure success. On the show bench 'Jesse's Song' is superb and I have taken grand champion with it at the NSW region of the ISA show in Sydney in the year when the two best spikes at the show were both of 'Jesse's Song'. Breeding is (Charmed Circle x Kiss) X (Smoke Rings x Decolletage) and I cannot recommend or praise this Iris highly enough. 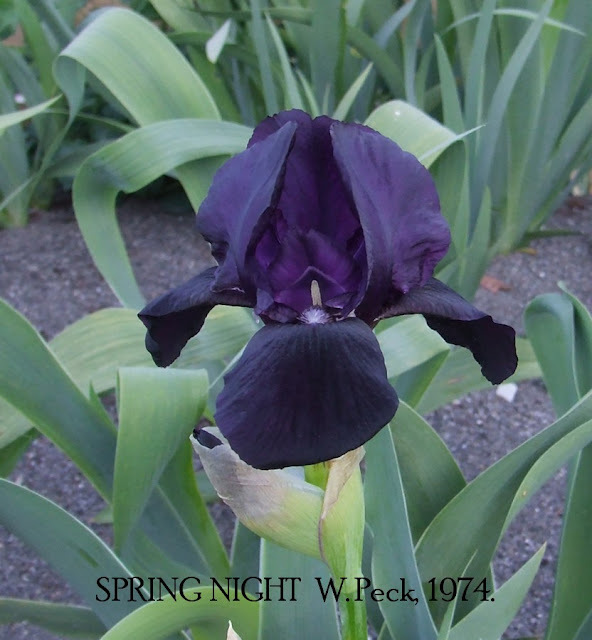 JESSE'S SONG (Williamson 1983) EM 35"
With a prominent accent on its generous ruffled form, this plicata is well known for its fine garden growth. The centers of the flowers are solid white, the plicata patterns are actually bands of violet peppering around the falls. The standards are more solidly colored. An exceptionally fine branched stem with 7 to 8 buds. A white center on the falls is framed by a striking violet plicata border.The standards too, have a clean white ground with a substantial plicata band. The beard is lemon, tipped blue white. HM '85; AM '87; Dykes '90. AM I BLUE (D. Denney, R. 1977). Sdlg. 0 72-134-1. BB 20" (51 cm) E. S. pale blue with intense navy blue infusion through midribs and styles; F. pale blue; deep navy blue beard. Strange Magic X Sapphire Hills., Cottage Gardens 1977. 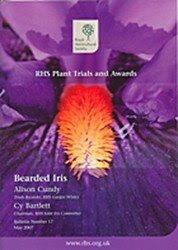 Have you seen the new brochure about the Bearded Trials published by the Royal Horticultural Society ? This bulletin follows the completion of a trial of 151 Median Bearded Irises and 112 Tall Bearded Irises at RHS Garden Wisley. 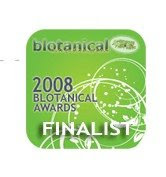 The bulletin gives details of 90 AGM award-winning bearded irises in this group. 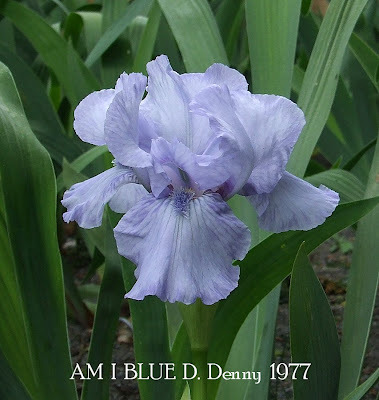 It contains pictures and descriptions of each AGM cultivar, plus advice on cultivation and Bearded Iris classification. 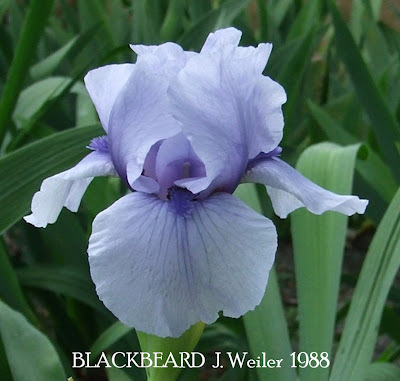 In 1981 WHOOP 'EM UP was awarded The Knowlton Medal ,the highest award reserved exclusively for Border Bearded Irises within the American Iris Society. With this in mind and the picture not much more needs to be said. WHOOP 'EM UP (D. Brady, R. 1973). Sdlg. B-BP-67-93. BB 27" (69 cm) E-L.
S. golden yellow; F. maroon with golden yellow on reverse side extending to top as all around edge; yellow beard. (Bang x Plunder) X Extravaganza., Skyline Iris 1974. 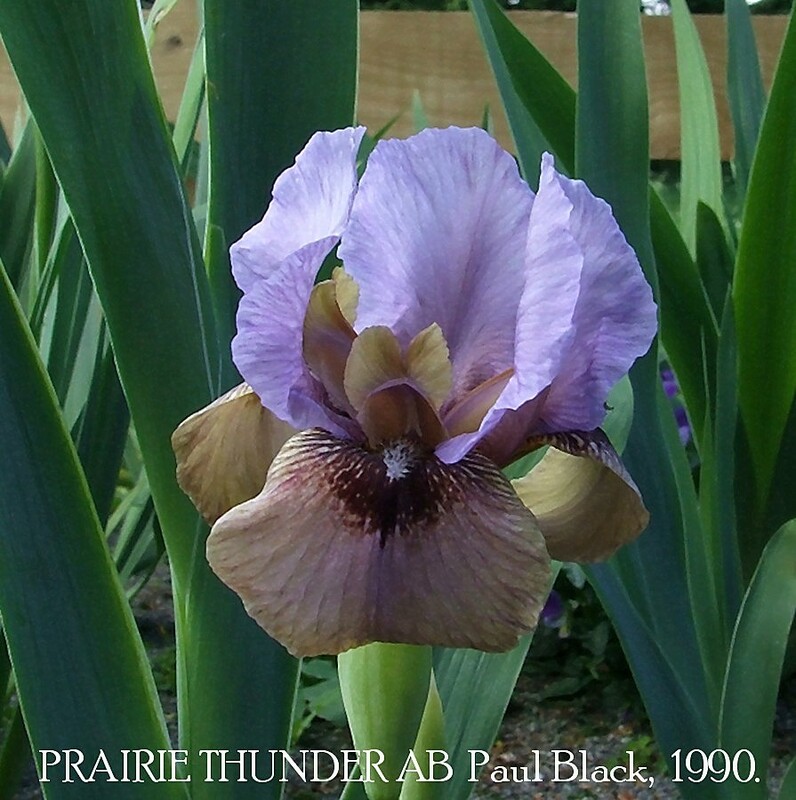 PRAIRIE THUNDER OB- (Paul Black, R. 1990). Sdlg. 86407A. AB (¼), 25” (64 cm), M. S. violet blue; olive tan styles; F. pale violet shading to tan edge; dark burgundy spot around beard; blue white beard tipped brown black; slight spicy fragrance. 83158C: (Cindy Mitchell x Silver Finery) X Welcome Reward. Mid-America Iris Gardens, 1990. SPRING NIGHT (W. Peck, R. 1974). Sdlg. 6726. IB 23" (58 cm) M. Very dark violet self; light violet beard. Inky X Jet Black., Old Brook 1975. Two Recent Historic Intermediate Irises Out today Will Just give you the checklist details and fill in a bit more information later. ARCTIC MYST (A. Brown, R. 1964). Sdlg. M-358-4. IB 20" E, B1. Wisteria blue self, tan at haft; light yellow beard. (Snow Elf x blue sib) X Flyaway., Brown's Iris Gardens 1964. HM 1966. BLACK WATCH (R. Rosenfels, R. 1972). Sdlg. 684-S. IB 23" (58 cm) M. Very deep, velvety purple self; matching beard. First Night X Sable Robe., Rosenfels 1972. AMBER TIPS is another outstanding New Zealand Bred Standard Dwarf Bearded Iris. Just recently purchased last growing season this iris has certainly made itself at home rather quickly. Showing good increase and good plant health. I have assumed that the Iris was named as a play on the brand 'Amber Tips Tea' a product that has been New Zealand households for over a 100 years. Registered in 1978 makes the iris one of the newest Historic Irises!! AMBER TIPS (Mrs H. Catton, R. 1978). Sdlg. CB2/10. SDB, 10" (25cm), EM. S. pale coffee; F. deep chestnut, edged amber; pale violet beard. Knotty Pine X Cherry Garden. Wyuna Gardens 1982.